The drilling rig on the Cratty well pad as seen from Lake Arthur (the snow in the foreground) on January 19, 2018. Photo by Sam Hoszwa. It’s difficult to speculate on what exactly a year may hold. Unexpected twists and turns, for better or for worse, seem to come out of nowhere. There are so many unknowns, it’s hard to plan for anything. But there are a few things coming down the road this year in Butler County that are almost certainties. One of them is another expansion of the Bluestone plant. MarkWest has applied for a Title V operating permit under the federal Clean Air Act for phase four of the Bluestone Gas Processing Plant on Hartmann Road in Jackson Township. This toxic wasteland, already too large and too dangerously close to the Seneca Valley secondary campus, will likely get even bigger sometime over the next year. The facility already consists of three phases, and the next will be the fourth. Only MarkWest knows how large this monstrosity will ultimately be, but perhaps they should consider the fact that over half of the facility now is already in the floodplain of the Connoquenessing Creek, which flows just south of the plant. Maybe they do know that, and just don’t care. In Butler Township, Rex has promised, or threatened, that it will begin work on the Krendale well pad sometime in 2018. It’s been over three years since the pad was verbally approved by the township commissioners in September 2014, and the DEP issued 11 well permits in June 2017. A Rex representative, quoted in a Butler Eagle article covering MOB’s October 7th action demonstrating the evacuation zone around the pad, said that they were “ready” and would start within 12 months. If they are to be taken at their word, that means the Krendale pad will at least be started by mid-October of this year. MOB and Section 27 Alliance continue to organize around this pad, with a joint public informational program planned for this spring. Stay tuned for more details as the date nears. Meanwhile, S27A is continuing to raise funds for an intended legal challenge to the well pad, when and if the township ever issues a formal building permit for construction. Another unfortunate event we’ll be keeping our eye on is the PennEnergy W71 well pad in Jefferson Township, less than ¼ of a mile west of all four Knoch schools. A local resident has informed us that the well pad is nearly completed, and a metal bridge installed for the access road to cross a stream. Drilling will likely start there within the next month or so. It’s too late to stop this one, but MOB is looking into the possibility of hosting a program in the Saxonburg area, but we need to know if there’s enough interest to do so. If you live in the Knoch school district, please spread the word about this well pad, and ask your friends, family, and neighbors if they would be interested in a program and let us know. Also coming down the road is a new program MOB will be hosting in May. Taking a more positive turn, this program, called Re-Imagine Butler County, will try to imagine a more sustainable, equitable, and advanced future for Butler County. We’ve partnered with Jennings Environmental Education Center to host the program, and planning will be getting underway soon. Look for more details this spring. Also happening in May, the Eastern Hardwood Forest Association will hold its annual Heartwood Forest Council in Butler County. Scheduled for Memorial Day weekend, the council will feature speakers, seminars, workshops, and field trips to visit both beautiful natural areas and fracking sites and infrastructure in Butler County. Look for more info later. If 2018 is anything like 2017, it promises to be a year of ups and downs, and certainly a wild one. By the time it’s over, who knows what will have happened. But for now, MOB wishes you a happy, healthy (and slightly belated!) New Year. Hopefully, more good comes to pass than bad. The Cratty well pad on January 19, 2018. Photo by Sam Hoszwa. The access road bridge for the PER W71 pad. Photo by Ed Duffy. FRANKLIN TWP—The “big rig” is back up on the Cratty well pad on Election House Road. Used for drilling the horizontal portion of the wells, the rig is drilling the two Cratty B unit wells that were permitted last September. Nearby residents report bright lights, loud noises, and shaking that keep them awake at night. There is a sound abatement wall, but only on one side of the pad. Those who are tuned in remember that this well pad is entirely within the watershed of Shannon Run, a stream directly feeding Lake Arthur in Moraine State Park. 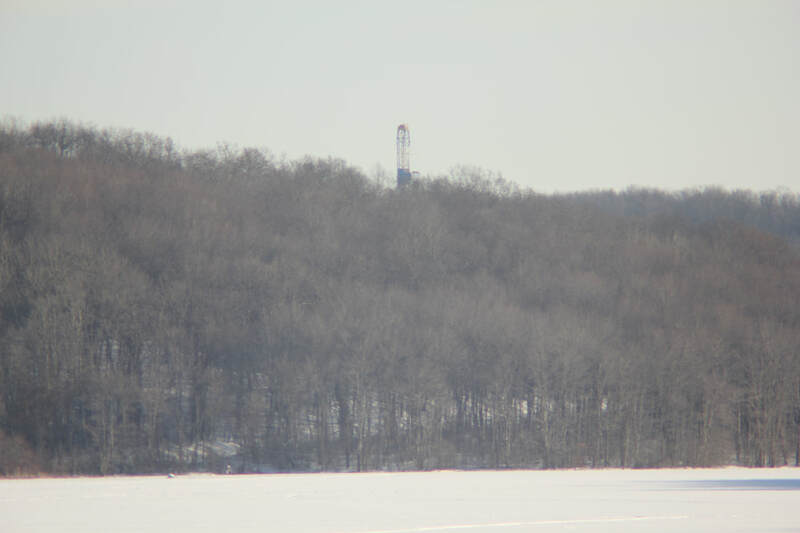 In fact, the rig itself is visible from the lake and the Route 528 boat launch in the park, sticking up well above the tree tops. The pad was built and drilled after a legal challenge from Save Lake Arthur Watershed and the Delaware Riverkeeper Network was unsuccessful in stopping it in 2017. JEFFERSON TWP—Construction of the well pad and access road of the PER W71 site is nearly complete. This is the pad located less than a quarter-mile from the Knoch schools, and less than 1 mile from the borough of Saxonburg. 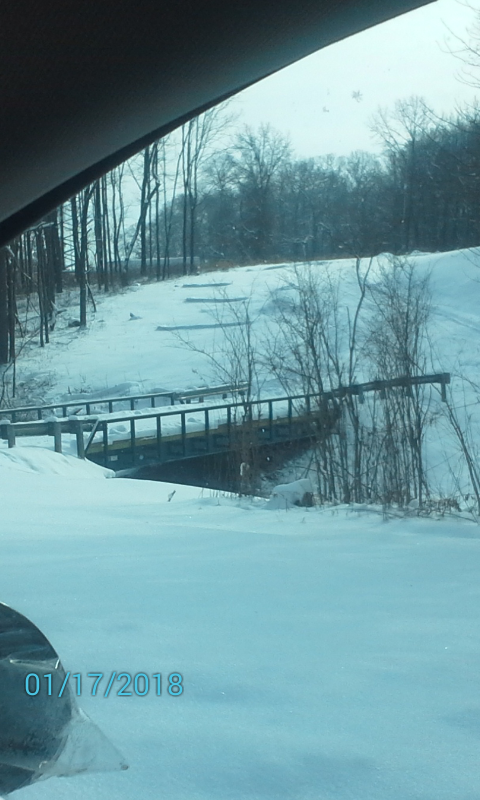 A local resident has reported that a modular steel bridge was brought in to span a small stream running parallel to Dinnerbell Road to allow access to the site. The construction entrance is also located just outside the designated School Zone, where a 15 MPH speed limit is enforced during school arrival and dismissal, and construction signs are set up within the zone. Drilling will likely begin in the next few months. ALLEGHENY TWP—On January 5, the DEP issued 10 well permits for EdgeMarc’s Canis Major site on Squaw Valley Road. This will be only the third well pad in the township, and EdgeMarc’s second, in one of Butler County’s least-fracked townships. BUTLER TWP—XTO was issued a modification of their erosion and sediment control permit for “temporary storage structures” on the AK Steel A well pad located on private, residential-zoned property on Schaffner Road. This pad was the impetus for the formation of Section 27 Alliance back in June 2014. The pad is complete and the wells have already been drilled, so the purpose of this modification is unknown. PENN TWP—Another “big rig” is up on the Hofer well pad on Anderson Road, just north of the Middlesex Township line. The Rex well pad has four wells total. CENTER TWP—Work on the fracking stage continues at the Isaacs well pad on Heinz Road. A large crane can be seen above the pad from Route 422 in Mount Chestnut. Meanwhile, on the other side of 422, another crane is in the air above the Lesney pad, just over the Connoquenessing Township line. Both pads, less than a mile apart, belong to XTO, and are currently connected by an above-ground temporary waterline. Protests against the Mariner East 2 pipeline on the Gerhart land. Photo by Michael Bagdes-Canning. HARRISBURG—The DEP shut down construction of the embattled Sunoco Mariner East 2 pipeline on January 3, citing a long string of “egregious and willful violations” committed by the company. Between May and September 2017, the DEP cited Sunoco for 30 spills in southwestern Pennsylvania alone: 18 in Westmoreland County, 10 in Washington County, and two in Allegheny County. The DEP said that Sunoco demonstrated a “lack of ability or intention to comply” with state laws safeguarding land and water, and that stopping the project was the only way Sunoco would get the message. This pipeline has been the subject of an ongoing battle between the Gerhart family and their supporters after Sunoco took their Huntingdon County land by eminent domain. 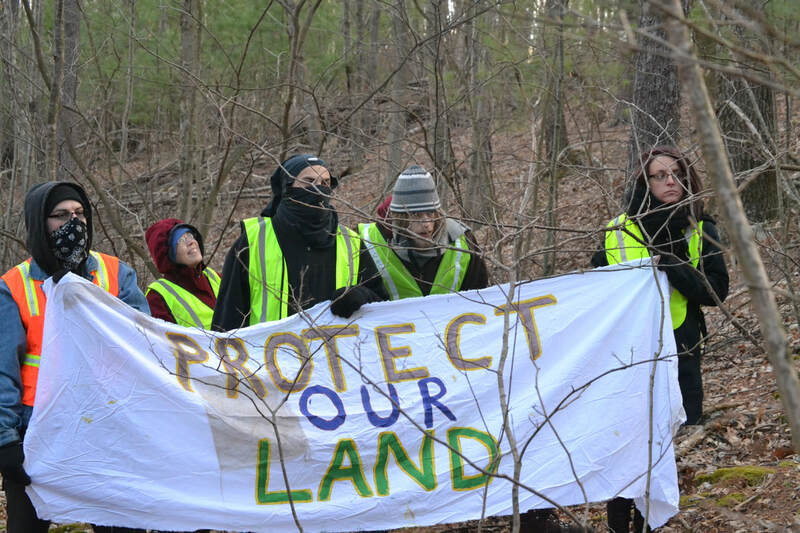 The Gerharts built an opposition camp, called Camp White Pine, on the part of the right-of-way through their property, and have been occupying it since. The family had challenged the land taking in court, but was making little progress. The fate of the pipeline now is unclear. Read more about the work stoppage here. PHILADELPHIA—The Delaware River Basin Commission will begin holding hearings on the proposed fracking ban in the Delaware River watershed. The first hearing, to be held in Waymart, PA, is one of several on the proposed ban. The Delaware Riverkeeper Network, known in our area for funding and assisting in challenges to the Geyer well pad in Middlesex Township and the Cratty well pad in Franklin Township, is a strong supporter of the ban. The Delaware River watershed covers parts of Pennsylvania, New York, New Jersey, Delaware, and Maryland, and is the drinking water source for the city of Philadelphia. Read more here. BEAVER—The DEP is currently accepting public comment on a proposed 60-mile pipeline that would connect the currently under construction Shell cracker plant with other facilities in Pennsylvania and Ohio. The 12-inch-wide line would bring natural gas to the facility to be pressurized into ethylene and polyethylene for use in making plastics, and will run through Beaver, Allegheny, and Washington counties. The public can comment on the impact the pipeline would have on waterways and wetlands by February 20. Needless to say, the completion of this plant will spell doom for Butler County, as we’ll become a major source of gas to feed the monster. Read more and find out how to comment here. ALLENTOWN—The Federal Energy Regulatory Commission, or FERC, approved the route of the PennEast pipeline on January 19. The 120-mile pipeline would transport fracked gas from near Wilkes-Barre to Trenton, New Jersey. Like other major pipelines in Pennsylvania, it has faced major opposition, and opponents are now turning to the federal Clean Water Act to attempt to stop it. Read more here.